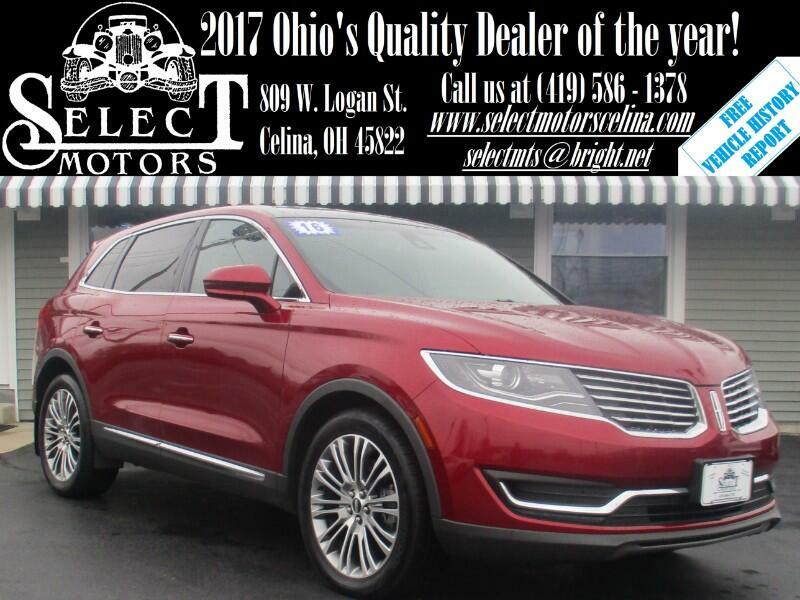 ***TXT US @: (419) 362 - 6200*** Reserve Pkg, AWD, 3.7L V6, Navigation, dual vista moon roof, heated/cooled leather, heated steering wheel, heated 2nd row, power lift gate, keyless entry with remote start, backup camera/sensors, automatic headlights, home link, blind spot monitors, signal mirrors, dual automatic climate control power windows/locks/mirrors, AM/FM, SiriusXM, auxiliary and USB port, steering wheel mounted audio controls, Bluetooth, dual power seats with power lumbar, tilt and telescopic steering wheel, cruise control, information center, 20" alloy wheels. Fuel Economy: 16 city / 23 hwy. Warranties: Balance of 4 years or 50,000 miles and 6 year or 70,000 mile powertrain. In service date: 04/25/2017. Extended service contracts available. The Lincoln MKX is fully redesigned for 2016. Highlights include new exterior sheet metal, a roomier interior, higher-quality materials, a new turbocharged engine option and adaptive suspension dampers for all-wheel-drive models. Later in the model year, Lincoln will replace the MKX's previous MyLincoln Touch infotainment interface with the improved Sync 3 system. The 2016 Lincoln MKX is a five-passenger crossover SUV. There are four trim levels (Lincoln calls them Groups): Premiere, Select, Reserve and Black Label. Standard equipment for the 2016 Lincoln MKX in base Premiere trim includes 18-inch alloy wheels, adaptive suspension dampers (AWD models only), automatic xenon headlights, LED taillights, keyless ignition and entry, remote engine start, rear parking sensors, rear privacy glass, heated side mirrors, an auto-dimming rearview mirror, dual-zone automatic climate control, leatherette upholstery, active noise cancellation, heated eight-way power front seats (with power lumbar support), driver memory functions, a leather-wrapped tilt-and-telescoping steering wheel and a reclining, 60/40-split second-row seat with power-folding seatbacks. Standard technology features include voice controls (Sync), Bluetooth phone and audio connectivity, a rearview camera, a configurable instrument cluster, a central 8-inch display with a touchscreen interface (either the MyLincoln Touch infotainment or the newer Sync 3 system, with availability depending on when the MKX was built) and a 10-speaker audio system with a CD player, satellite radio, an auxiliary input and two USB ports. The Select Group adds LED daytime running lights, power-folding side mirrors (the driver-side mirror gets an auto-dimming feature), a hands-free power liftgate, leather upholstery, a power tilt-and-telescoping steering wheel and wood trim. The optional Select Plus package adds a navigation system and blind-spot and rear cross-traffic warning systems. The Reserve Group adds 20-inch wheels, adaptive headlights, ventilated front seats, mobile-app compatibility, a panoramic sunroof and the contents of the Select Plus package.